Hi Guys! Manali is one of my favourite places in Himachal! When I'm in Manali, there are certain things that I always cherish doing. On my recent visit, I was introduced to a few more activities that are now on my Manali to-do list. So, for the uninitiated, who’ve never visited this wonderland, I’ve penned down a list of things you can do, to enjoy a perfect day in Manali. Casa Bella Vista is an authentic Italian cuisine restaurant located on a tranquil hill. The facade of the restaurant is made of wood, glass and stone and there are tall coniferous trees in the background that lend a shade to it. I would recommend having lunch at the place and order from among their plethora of pizza varieties (you can choose your own toppings too!). The specialty of the place is, that you get to watch them cook in their wood fired hearth in the open sitting area. The smoke from their oven, mixed with the smell of Fresh baked bread will tantalize your senses even before you begin eating. You’ll immediately fall in love with the little Italian experience. If you are staying in Manali for a few days, look for a place to stay in Old Manali. You don’t want to miss the opportunity of enjoying the myriad of Bakeries, eateries, pubs, cafes, hippie apparel shops etc. by the streets during your visit. Buy yourself colourful clothes to fit right into the vibrant vibe of the place! Listen to some live music streaming through the restaurants by the streets in the evening. Pick up some fresh bread from a German Bakery while you’re traversing the slopes of the streets. And if your room has a balcony, like mine did at Dragon Inn (Read my TripAdvisor review, here), sit there and breathe in some fresh air at night over a glass of coffee or tea. The river water in Manali is icy cold for most part of the year as it melts down from snow clad mountain-tops. If you try dipping your feet in the waters, they may chill you too much for your comfort. However, you could plant your beverages in the river water, while you sit and wait for it to cool. Also, hog on some hot piping maggi from the nearby vendors. The scrumptious combination of Maggi and river chilled beverage is to die for! I am unabashedly a wine lover, so I chilled a bottle of grape wine and sipped it along with my Maggi. I’m sure you’ll love the experience as much as I do. In the photo below I'm on Vashist Road. Lazy dog is a river side restaurant in Old Manali. 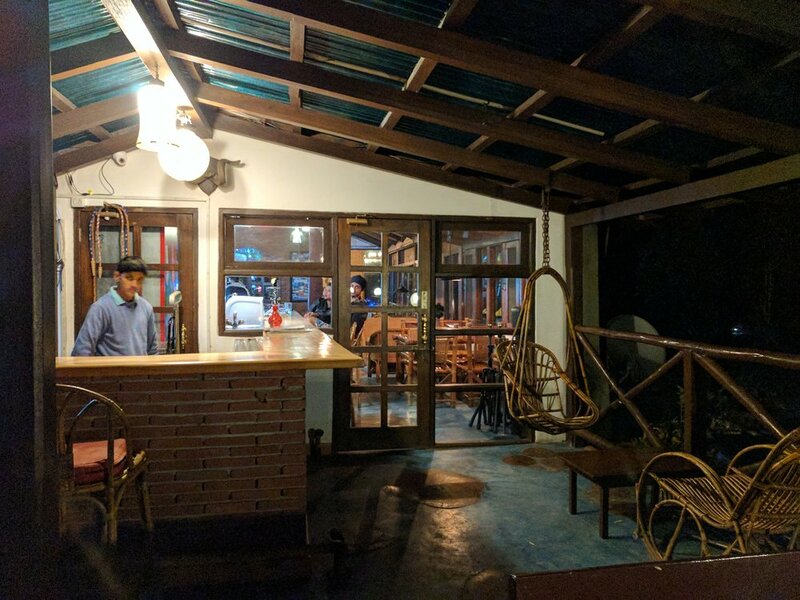 It offers a great view of Beas river, especially if you’re willing to brave the cold in the evening and sit outside for a meal. If there's a live fire in a hearth to warm you, it’s a definite win-win. The sound of gushing water along with soulful delicious food, is to die for. It’s calming, soporific and meditative to sit and eat here. You can definitely guess that I love this place too much. From among the food, do try their Arrabiata Penne pasta cooked in wine sauce! Trout fish is among the famous food items of Manali. The fish was introduced in the Himalayan waters by the British and is still available in abundance. So, if you love to fish or eat fish or are predominantly non-vegetarian, try the famous fish at any restaurant. I got some baked for myself from Pumpernickel Bakery (Old Manali) during my visit and ate at my hotel balcony. Nature Park, Manali is a forest reserve area that encloses large groves of tall Ceder and Deodar trees. The best season for a walk in the park is from May to October. Go to the park for a walk or a jog! You'll be spellbound by how tall the trees are and will be transported to another world because of the mysticism of the place. Believe me, the place looks like it is right out of the sets of Narnia. The park can be easily identified from a distance. However, you'll be able to find it on your way to Old Manali from New Manali. Needless to say, Himachal is the fruit capital of Apricots, Plum, Peaches, Strawberries, Cherries and Apples. Whenever you get the opportunity, pick up some fresh fruits and gorge on them! These fruits sell at a lot of stalls and mom & pop shops in Manali. Let me know in comments below what did you think about these activities. Also, let me know how many did you check off your list! To add more suggestions, feel free to mention it in the comments for other travellers!